The rumours for a while have been that September 12 was to be the day the new iPhone was to be shown off by Apple, and they were right. Apple today announced that on September 12, at 10.00 am Pacific Time in San Francisco an event will take place at the Yerba Buena Center for the Arts. That translates to the event starting at 3.00 am on Thursday, 13 September 2012 Eastern Standard Time. I had thought that Apple would follow the new naming convention it started with its latest iPad, which is simply called the new iPad. But that would appear not to be the case if you look at the graphic that accompanied the invitation, copied above. It looks plain and simple that the new iPhone will be called the iPhone 5. So, let the speculation and rumours intensify. Just how big will the new screen be? Just how close to the truth are those “leaked iPhone 5” images? 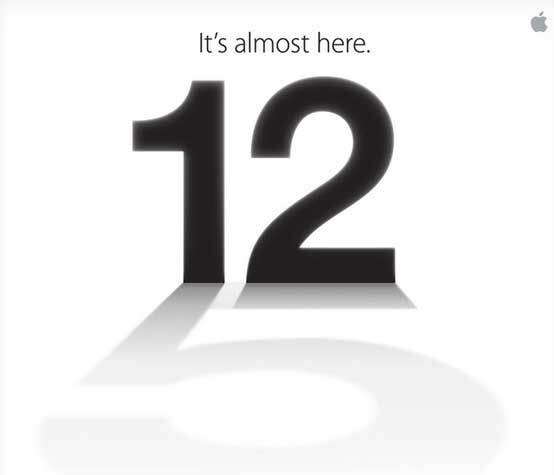 What new iOS6 tricks will there be, over and above what has already been revealed? Will there be any mention of the mythical iPad nano / iPad mini, rumoured for an October announcement? Who knows. We’ll find out soon enough. To recap, the current iPhone, the iPhone 4S, was announced on 5 October (Australian time), 2011. It went on sale in Australia on October 14, and was the first country in the world to get its impatient hands on the thing. Will we make the top first division this time too?